Opinion: Foreign Forces Did Not Start Venezuela's Transition. Venezuela Did Venezuela's government and opposition triggered the political standoff that is drawing an international response. Latin America expert Javier Corrales explains how. Venezuela's congressional leader, Juan Guaidó, is being recognized by a rising number of countries, including the U.S., as the South American country's interim president. 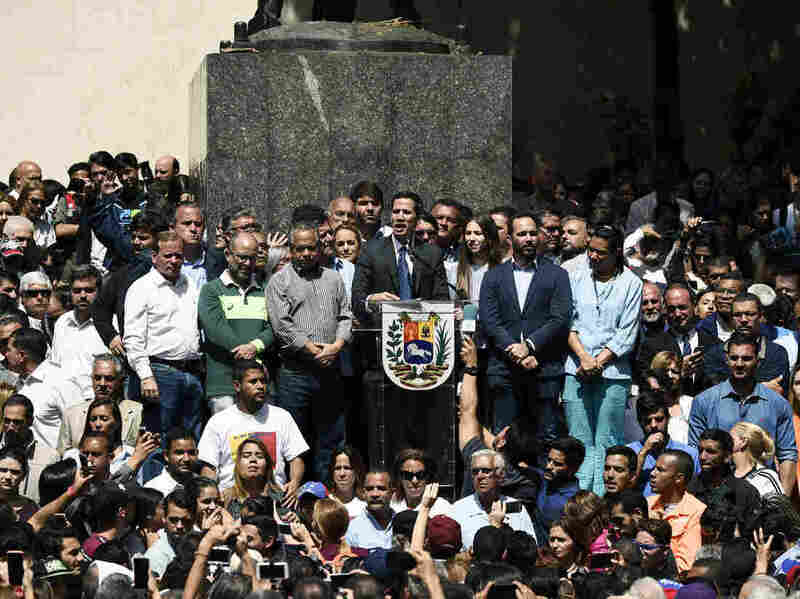 Here, Guaidó (center) speaks to a crowd of opposition supporters at Bolívar Square, in eastern Caracas, last Friday. Javier Corrales is a professor of political science at Amherst College and author of Fixing Democracy. Venezuela's authoritarian government is unraveling, and possibly undergoing regime transition. Outside forces are playing an important role — but in an unexpected fashion. Typically, foreign governments create conditions inside a country for a rupture with the status quo by providing moral, financial or even military support. But in Venezuela, since 2015, it has been the foreign policies of Venezuelans themselves that have triggered an international response, not the other way around. Here's how the crisis unfolded. In May 2018, socialist President Nicolás Maduro declared himself the winner in an election that was unfree, unfair and fraudulent. On the day of his inauguration, Jan. 10, National Assembly President Juan Guaidó refused to recognize Maduro's new term, calling him "a usurper" for arrogating the presidency without a democratic claim to it. On Jan. 23, Guaidó went further by declaring himself interim president and calling for new elections. He did this by invoking the Venezuelan Constitution, which stipulates that in the absence of a legitimate president, power must go temporarily to the head of the country's legislature, the National Assembly. What is shocking is not so much that there are contested claims to the presidency — that happens often in regime transitions — but that the opposition managed to obtain such decisive support from so many quarters. Of the governments that have commented publicly, more than 50 countries have expressed support either for the National Assembly, for Guaidó himself or for his central message of the need to call new elections, according to Prodavinci, a website for Venezuelan analysis. The Trump administration immediately recognized Guaidó as interim president and has since ratcheted up pressure on what it now refers to as "the illegitimate former Maduro regime." Meanwhile, Prodavinci counted only 15 nations — including Bolivia, China, Cuba, Iran, Russia and Turkey — that have expressed support for Maduro. Nearly the same number have said they won't take sides and instead are calling for dialogue to resolve the crisis. In terms of international opinion, the opposition is winning. Several years ago, the situation was the exact opposite. Despite receiving moral support from key lawmakers and thought leaders in the United States and other nations, the Venezuelan opposition was largely isolated internationally. How did this reversal in international backing occur? The answer lies with the foreign policies of both the government and the opposition. Maduro inherited from his predecessor, Hugo Chávez (in office from 1999 to 2013), one of the most interventionist foreign policies in Latin America's post-Cold War history. Much of the region's response to the Venezuelan crisis can be traced back to this interventionism. In the 2000s, Venezuela began to interfere in almost every Latin American country, supporting leftist radical groups, transferring nontransparent subsidies to friendly movements, openly insulting presidents who disagreed with Chávez and even supporting terrorists in Colombia. Many of these Venezuelan-supported allies, if they won power, repeated offenses similar to those of Chávez: concentration of power, high-level corruption, sectarianism, secret deals with the Chinese and mistreatment of the media. One of the consequences of Venezuela's interventionism has been Latin America's remarkable shift to the right since 2015. This shift has many explanations that cannot be reduced to a single story for all. But in almost every case, an important factor is a reaction to the bad behavior of the Venezuelan-supported left in each country. Latin American governments are not opposing Venezuela merely because they are on the right; instead, they are now on the right, and criticizing Venezuela, in response to what Venezuela did to their countries. Venezuela's polarizing interventionism did not end when it started to run out of petrodollars in 2014. In fact, it acquired even more objectionable dimensions. As oil revenues declined, Venezuela began to engage in more illicit financial operations, prompting major rifts with Panama and several European countries concerned about money laundering. As dissent in the armed forces grew, Venezuela intensified its support for narcoterrorism, which in Venezuela operates from within the military. Venezuela's support for drug trafficking is directly affecting crime rates in Central America, the Dominican Republic and Mexico. And as Colombia's government reached a peace deal with its largest rebel group, Venezuela began to support an alternative one, the National Liberation Army, which in mid-January took responsibility for a suicide bomb attack at a police academy in Bogotá that killed at least 20 people. As if regional interference was not enough, Venezuela is now also exporting poverty. Because of the government's refusal to address the country's five-year-old economic crisis or even consider humanitarian aid, Venezuelans looking for food and medicine are leaving in droves, inundating the strained institutions of many recipient countries in South America. Venezuela's foreign policy has exported corruption, poverty and death across the Western Hemisphere. In sum, a costly legacy of the Chavistas — as the officials and followers loyal to former President Chávez are known, even after his death in 2013 — is that Venezuela's foreign policy has exported corruption, poverty and death across the Western Hemisphere. So today it is not surprising that so many Latin American countries are filled with anti-Chavista sentiment across the electorate. In supporting Guaidó, Latin American presidents are responding therefore not just to events in Venezuela but also to anti-Chavista sentiment in their own countries, itself the product of Venezuela's foreign policies. The United States is also responding to Venezuela's foreign policies. It is not clear that the Trump administration cares much about human rights in Venezuela. But it cares deeply about Venezuela's non-oil exports, especially drugs. The United States also dislikes the way that Venezuela treats Colombia, a key U.S. ally in the region. But it's not just the foreign policy of the government that has mattered in determining the international response. The foreign policy of the opposition has also been crucial. In 2006, the opposition had a terrible reputation across the globe. It was seen as composed of recalcitrant, obstructionist, elitist sore losers unwilling to accept the reality that they could not win elections against Chavismo. The opposition — a loose coalition of more than two dozen political parties on the left and right — then spent the next decade reconstructing its international image. That meant doing work at home and abroad. At home, the opposition became more democratic, meaning more eager to participate in elections, even if they were increasingly slanted. The opposition mobilized voters, growing electorally to the point of obtaining full control of the National Assembly in 2015, despite rigged electoral rules. Abroad, the opposition engaged in a systematic campaign to denounce Chavismo for all its faults, including human rights abuses. Members went to the right places — the Organization of American States in Washington, D.C., The Hague and European capitals. For Venezuela's May 2018 presidential election, many parties were banned, others boycotted, but the opposition succeeded in getting 47 countries to not recognize the vote. International activism has continued since. A recent Associated Press report provides nitty-gritty details of that activism. It was one thing to have international leaders refuse to recognize the election; it was another to get them to support Guaidó's assuming temporary powers. This was initially seen as too risky. So Guaidó and his party bolstered their international efforts. This meant secret trips by members of Guaidó's party and other lawmakers across the border, personal visits with foreign presidents, discussions with both moderate and hard-line factions abroad and waiting until they garnered sufficient backing to initiate a transition. Guaidó created the international response he wanted rather than responding to external cues. This is not to negate the importance of foreign influence in shaping developments inside Venezuela. Factors such as rising U.S. sanctions hurt the government and encourage the opposition. And now that the United States has fully sided with Guaidó, it may end up taking the driver's seat. But it was not internationally predetermined that Venezuela's opposition would gain the upper hand. It is a result of the Venezuelan government's own foreign policy blunders and the opposition's diplomatic achievements. Venezuela shows that local forces have the capacity to move foreign affairs. However weakened they may be, they are not just recipients of foreign influence but also shapers of foreign forces.